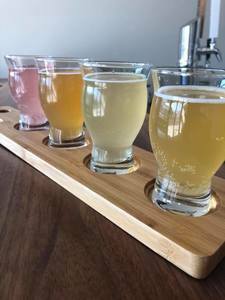 Danbury's Cross Culture Kombucha Announces Tap Room Opening! Join us for the Opening of CT’s 1st Kombucha Taproom & Brewery on Thursday, September 20 from 5 PM – 8 PM at 52 Division Street in Danbury. For 3 days, we will have the best prices on our raw, fresh and delicious kombucha. Six flavors will be rotating on the taps, with lots of favorite limited editions. The Green Grunion food truck will be here 9/20 serving up our favorite burritos and nachos! We have raffles for awesome local businesses and CT-made food products. We are raffling off a year’s worth of Cross Culture Kombucha. Our new location serves as a brewery as well as a taproom, and guests will be able to learn about kombucha and how it’s made. Learn more on the event Facebook Page here. Cross Culture Kombucha is based in Danbury and brews, kegs and bottles kombucha using high-quality organic ingredients and live cultures. Our kombucha is always fresh and is sold both on tap and in bottles at various locations throughout Fairfield County and beyond. Visit us and purchase directly at Fairfield Farmers’ Market (Sundays) and Westport Farmers’ Market (rotating Thursdays).